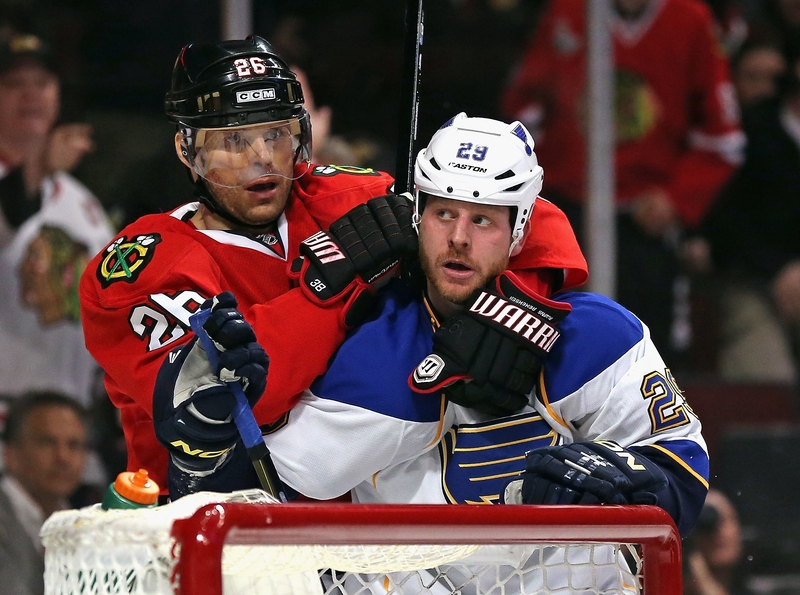 St. Louis Blues forward Steve Ott is a good fit for playoff hockey, as his team takes on the Chicago Blackhawks. ST. LOUIS – This was what Steve Ott signed up for, exactly what he hoped for when the Buffalo Sabres traded their captain on that February Friday which suddenly turned Ott and Ryan Miller into St. Louis Blues. Ott has longed to get back to the playoffs, where he had not been since 2008 with the Dallas Stars. He turns 32 in August. There are only so many chances. Ott’s in the middle of a great one now between the Blues and Chicago Blackhawks. And what a doozy of a series it’s been. Full of chippiness and trash talking. In other words, it’s perfect for perpetually in-your-face types like Ott. The ’08 Stars lost the Western Conference final to Detroit, and Ott hasn’t had a glimpse of the postseason since. “I’ve been waiting for that moment for a long time,” he said. “To have that feeling jump-started and get back after it, this is why we play this game. This is why we fight so hard for 82 games, to scratch and claw and get a chance in the playoffs. You can find references all over Twitter and in the media corps covering this series about the “St. Louis Sabres.” Derek Roy, a healthy scratch Friday, and Jordan Leopold also play for the Blues. But most Buffalo fans are focused on Miller and Ott. Ott had a good laugh when told that Patrick Kane’s overtime winner for Chicago in Game Four was probably the first time the South Buffalo native ever had some folks back home fretting over his exploits. In addition to the years of good will built up by Miller, Sabres fans are hoping the Blues win this series and draw closer to giving Buffalo their No. 1 draft pick for Miller. That happens, remember, if they make the Western Conference final. “We all know there’s a lot to cheer for with this St. Louis team for the people in Buffalo,” Ott said. “It’s great to have that kind of recognition there in Buffalo for myself and Ryan. Ott’s success here has been modest, to say the least. He still hasn’t scored since arriving, collected just three assists and was minus-12 in 23 games after the trade. That made him a combined minus-38 for the season – the worst mark among NHL forwards. That’s not going to do much to enhance his value on the free-agent market. Still, Ott is about more than those numbers. He did have nine goals and 20 points with the Sabres this year and had a career-high of 22 goals for Dallas in 2009-10. He can score. More important, Ott is back to his old agitating, trash-talking self in this series. If he keeps it up and the Blues make a deep run, it will give teams pause to take a look this summer. The Sabres almost certainly plan to. Ott averaged 21:05 of ice time over the first four games – including 30:53 in the triple-overtime opener to the series. He was credited with 21 hits in the four games, with 15 coming in the two contests in Chicago. And he went 37-25 on faceoffs, topped by a 14-6 mark in Game Three. On Ott’s first shift Friday, he hopped the boards from the bench and made an immediate beeline to Hawks defenseman Duncan Keith to try to separate him from the puck. Later in the first period, he knocked the puck away from Patrick Kane on a dangerous rush inside the St. Louis zone. The Blues have to be wary of the Hawks’ speed, and Ott pretty much called the Kane play hours earlier. And while there’s plenty of chalk-talking that can break this one down, what’s been impressive to observers around the league is the every-night intensity of two 100-point teams going head-to-head in round one. “We knew it would be a heck of a series, and I don’t think anybody would have predicted it going any other way but being hard-fought just like this,” Ott said.